A favorite shopping excursion for my husband and me is to check out the local antique shops where ever we travel. A recent find in Naples Maine was boxes full of old crystals from chandlers. My mind immediately began racing and before I knew it, I had purchased literally a bucket full of potential projects. After carefully removing the old wires, I soaked the crystals in ammonia and water. As I laid them out on my dining room table to dry, I sorted them by shapes and sizes, and ideas began to form. 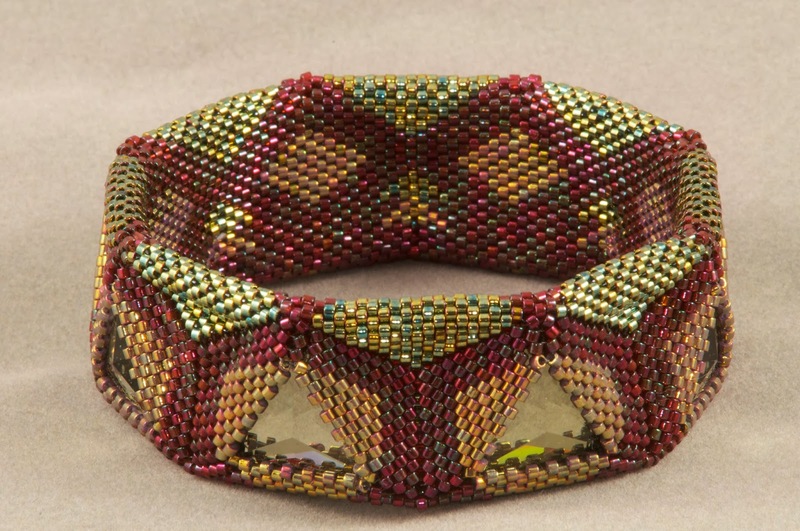 I could envision beaded bands around the various shapes using netting, peyote and Ndebele stitches. Several of the crystals had small chips, so I knew I would have to conspicuously place bead work to cover those spots. Still other crystals had unique shapes that would lend themselves to beaded bands, bales, etc. My husband pointed out that this was an excellent opportunity to also re-purpose some of my bountiful supply of surplus beads. At this point I see no limit to the variety of combinations that can be created. Below are a couple examples of ornaments using several different sizes of crystals, embellished with Delica beads and SWAROVSKI ELEMENTS. Have you ever finished a new design that you can't wait to offer as a class or kit form, only to find out a major component has been discontinued? This scenario can be a source of frustration, or motivation to get creative in a new or varied, "colorways." This has happened to all of us who design and over the past year it has happened to me twice on the same project. My first design of this bracelet included a favorite color combination of SWAROVSKI ELEMENTS and Delica Beads. As I often do, I purchase materials that catch my eye and then sit on them until my mind can put them together in a design. By the time this design was in teachable form, one of the element colors was no longer available. My first revision maintained as much of the original color combination as possible, but again, by the time I had a wearable bangle, another item was discontinued. This time I was forced to create outside my colorways comfort zone and the result turned out to be my favorite combination of the three. The moral of the story is, let inconvenience be another motivation for creativity. How I got started with beading! Every now and then I am asked, “how did you get started in beading?” It turns out to be a long story involving love of crafts (especially needle and thread work), a motivational home economics class in school (the stichin’ part, not the stirrin’), and time to focus on creative projects. 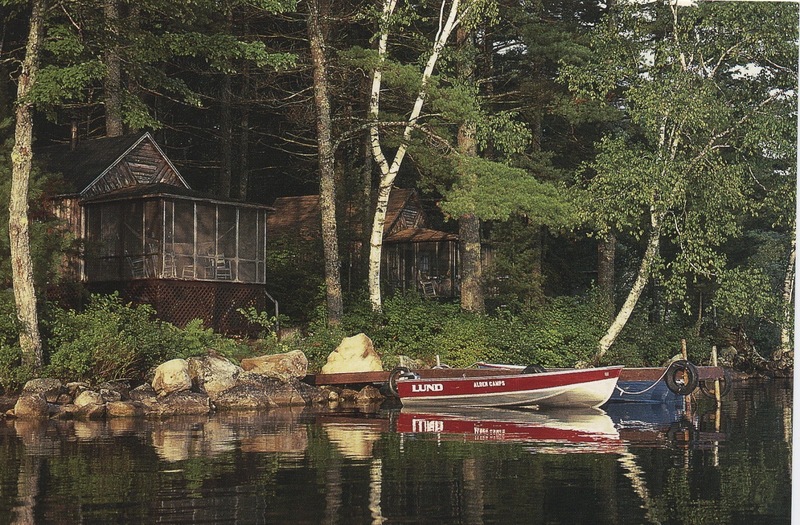 Since those days, I have come to love beadwork and Maine, and I look for every opportunity to bead in Maine at our own camp (with amenities and facilities) while my husband goes fishing. The equipment is very different now, the techniques are more sophisticated, and the supplies are the far more elegant and uniform, SWAROVSKI ELEMENTS and Delicas, but the love of the craft, and the excitement of creativity is the same. The moral of the story is that it really doesn’t matter how old you are when you first go to camp and learn arts and crafts. This blog will introduce my contribution to Crystal Jewelry Inspiration from the CREATE YOUR STYLE Ambassadors, 2013, Karin Van Voorhees, Editor, Kalbach Book, Waukesha, WI. This is a beautiful compilation of inspirational crystal projects submitted by thirty of the CREATE YOUR STYLE with SWAROVSKI ELEMENTS Ambassadors. The book also includes an international gallery of photographs. My particular project, “Simply Toggles,” is the final project in the Ambassador section of the book; as the most recent addition to the Ambassador Team, I am thrilled to have been a part of this publication. The diversity and scope of the projects are quite impressive. The large Checkerboard Crystals were purchased at Beadin’ Path in Freeport Maine, and I studied these for quite a while before coming upon the inspiration of a series of toggles. The complete directions for this project can be found with my bio in the book on page 130. If you give this project a try and you have any questions, you can find my contact information through my website, and I would enjoy hearing from you. Thank you for looking in on my blog; if you leave a message with your name, I will be pulling one name at random and sending that lucky person a kit to make my “Trapeze Ring.” This project was taught at the same venue in 2012. See picture above. You can learn more about the Ambassadors at their links below. All names will be forwarded to Kalmbach Books for an additional drawing to receive a free copy of the book.